Great tasting sauce, baked the wings instead of fried. Just like at the restaurant. Really phenomenal and fresh. As for the jalapeños, I recommend cutting them in half, seeding them, broiling skin side up until it gets blistery, and then peeling it off. Far easier than trying to deseed and skin after broiling. Really good pie dough recipe. I like to add 25% whole wheat. One of my favorites from the book, great flavor combo! Excellent! This one is on constant rotation. We love it. The sweetness of the honey with the spice of the jalapeños and pepperoni really works. This is like savory cheese and honey dessert meets pizza. If you can't find the sottocenere al tartufo cheese use a drizzle of white truffle oil after baking it - and don't skip those pistachios. Perfection! We make this week after week and still crave it. Don’t put under the broiler, use a torch. ...one of my favorite pizza places in NYC (side note their burger is beyond) now has their favorite recipes in cookbook form! The husband-and-wife team behind New York City's favorite new pizza share the secrets behind their award-winning restaurants in a cookbook featuring more than 100 recipes. 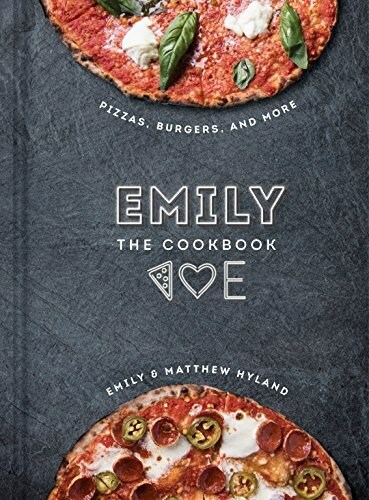 Emily and her chef husband, Matt, generously share the secrets that make their pizza stand out among thousands of restaurants in Brooklyn and Manhattan. And while they provide instructions for the only-pizza-dough-you'll-ever-need (for both thin round and thicker pan "Grandma-style" pies) they also teach the importance of simple cooking for amazing results--no fancy equipment necessary. Just as Emily is much more than a pizza place, EMILY: THE COOKBOOK shares recipes for NYC's favorite burger, appetite-arousing small plates, fresh salads, hearty and delicate pasta dishes, homey desserts, and intriguing cocktails.